More than 125,000 journeys have been made on the new Borders Railway during its first month in operation, according to ScotRail. The Tweedbank to Edinburgh line opened to the public on 6 September. ScotRail said public interest in the new route had "soared" after nearly a week of celebrations and the official opening by the Queen. It said additional carriages had had to be added to services particularly at weekends and "midweek peaks". The exact figure issued over the first month was 125,971 total passenger journeys. In addition, 17 sold out steam trains will have run on the line before mid-October, carrying around 6,200 passengers. Phil Verster, managing director of the ScotRail Alliance, said: "The incredible interest in the Borders Railway over the first few weeks highlights what a remarkable achievement has been made by the opening of the new line. "By helping to create new opportunities for the people of the Scottish Borders, Midlothian and Edinburgh, this line better connects the regions and benefits both the local people and the local economy. 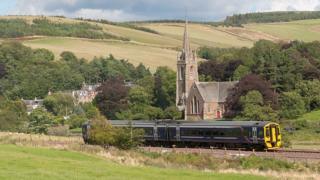 "There is a great future ahead for Scotland's railways, and the Borders Railway is an exciting part of that." Transport Minister Derek Mackay said he was delighted to see the "soaraway success of services" and impressive passenger numbers. "It is particularly good to see the Borders and Midlothian reap the benefits of being reconnected to Scotland's rail network after an absence of almost half a century," he added. Scottish Borders Council leader David Parker said he was always confident the route would be a success but even he was "taken aback" by the usage figures. "We have not only had Borderers using the service for work and recreation but many people from the central belt have been jumping on board to visit our region," he said. "The knock-on effect has already been seen, with local businesses such as cafes and restaurants reporting extra trade. "The aim of the Borders Railway Blueprint programme is for the railway to stimulate growth in our businesses, investment into our region and to create new jobs - already we are starting to see signs of all three and it bodes very well for the future." Before the £294m line opened, forecasters predicted it would carry almost 650,000 passengers a year. Former First Minister Alex Salmond said it could be used by one million travellers a year within five years.